Did you know that Paul Penders has more than thirty Facebook Pages representing every continent on the planet (except Antarctica, of course)? If we all were to “LIKE” one another, just think of how wide our reach could be! Please LIKE us! Leading the “Likes,” interestingly, is Paul Penders Egypt with 1,567 as of March 2013. Between headquarters and our distributors, at least 31 different Facebook sites share the good news about Paul Penders natural beauty products. Some are Community Pages, some Local Business Pages; some list under Health / Beauty or Health / Wellness or Products / Services. The “grand-daddy” of them all is Paul Penders International (click to go directly to the Facebook Page). Just opened in January is the Paul Penders Blog Page which channels all the blogs from the Paul Penders website (paulpenders.com/ppblog). Just like either or both and the blogs and other notices will automatically be posted to your Facebook Wall – which is very cool, yes? No matter where in the world you are – from tiny Mauritius in the Indian Ocean to giant Canada and Russia – there’s probably a Facebook Page where we can all connect. Or if you’re somewhere that still lacks its own FB site and you’d like to be a distributor or page administrator, then just “message” us on FB or send email to support@paulpenders.com and we can work together to get it set up. Here’s the list of Facebook Pages below. Click on any or all and “Like” so we can help one another to reach out to new “Friends” all around the planet! Oh — and please be sure to read my blogs that come out several times each week and the Monthly News! It is not that I dislike traveling – actually, I like traveling and have to do it a lot. I travel for business and for pleasure; it is always a pleasure to visit family but also to learn new things in life. The more I travel, the more I understand we do not know much about what this beautiful planet — including its people, plants, oceans and whatever — has to offer. As for business, this time, my son Bas and I went ‘on the road’ as we had an excellent opportunity to visit a company in the Himalayas — not just another company; a wonderful company in the business of herbs and a lot more. The firm is called Planet Herbs Lifesciences; it’s a young company with a GMP in pharmaceutical and cosmetic manufacturing with their own labs. And more, they have a vision to become one of the best suppliers of high quality products made from natural ingredients, many organically grown in the Himalaya Mountains. They contacted us last year and as they wanted to work together to bring our products to the market in the region (India, Pakistan, Sri Lanka, Bangladesh, Nepal, etc.). They will use our formulations and make the products over there exactly according to our prescription. Why not manufacturing at our own premises in Malaysia? Because avoiding import regulations and import taxes makes our product more affordable to the people in the region. So Bas and I set off from our small island in Malaysia to Kuala Lumpur and then flew to Delhi, after which we had a 6-hour train ride, which also was a wonderful experience. Readers of our blog know of my love for trains. I rode them often in the US (and although old-fashioned, it’s a wonderful way to see the country). Several months ago, I bought a EURAIL pass and for days was on these fast high speed trains which can bring you from Amsterdam to Nice in France in just 8 hours. 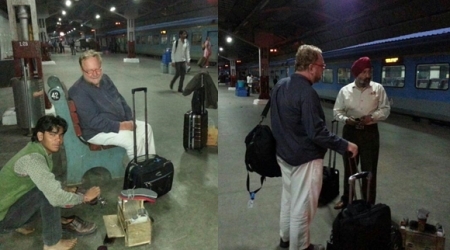 The Indian trains may not be as fast or as luxurious as the European and Japanese ones – but they certainly make up for that by their coziness, and well… the food served — an unlimited amount of food! They keep bringing it with smiles and it is deliciously prepared. Actually, I boarded the train at 6 am and they made sure that before the regular 9:30 am breakfast, an early ‘snack’ and coffee was served with baked eggs, bread, coffee, milk. I finished all that and then REAL breakfast came with wonderfully prepared North Indian dishes — and you could choose between vegetarian and non-vegetarian as well. On a train trip like this one, you have time after eating to rest. Or you can do business work as plugs are there for computers. The trains rattle on at some 140 km per hour through amazing landscapes, even passing by an elephant reservation that took 45 minutes to get us through! Our friend and the initiator of this new business, Mr. Gurinder Singh Rance, traveled with us to Dehradun at the foot of the Himalayas. There the business part of our visit took place over the next few days. We were welcomed by the Chairman, Mr. V.K. Dhawan, a busy man who also has other businesses in the US, the Middle East and other countries. One evening we went for a trip up into the Himalayas, which was one I will never forget. We were as high as a plane (in my view) and the roads became smaller and smaller. 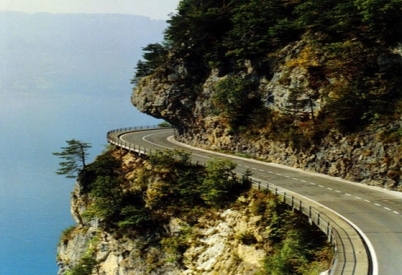 At one time, we needed to turn the car and I felt very uncomfortable eyeing the drop-off of few kilometers and was ready to flee that car before I saw us going down! But no, the drivers there are trained and my friend Grinder told me not to worry. So the fact that I can write this story now back home on the small island where I live means we survived the trip — and it was most memorable! 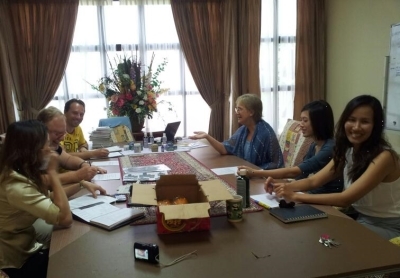 Since moving to Malaysia, my son Bastiaan always seems to be surrounded by beautiful women — as seen here with members of our staff at Paul Penders Headquarters in Penang, Malaysia.. When my eldest son Bastiaan decided to leave his banking career in Holland and join my company in Malaysia, we took together several days to drive around Penang island and happened upon a sleepy little fishing village. We turned a corner and there was a compound featuring offices and warehouses, which had a sign out front advertising space for rent. It seemed like a happy coincidence – here the Paul Penders company could have a laboratory, warehouse, and office space as well as comfortable housing just next door. Bas would be able to enjoy the city life and tourist comforts of Georgetown and still retreat to the peace and quiet of the little village where the pace of life is slower. It can take a bit of doing to get there but Penang is worth a visit! Only an hour by plane from Malaysia’s capital, Kuala Lumpur, the tropical island paradise of Penang is a world-class tourist destination. Most travelers head into the gorgeous historic district of Georgetown, the main city on the island of Penang, where the global mix of Chinese, Indian, Malay, and Western cultures appears in the architecture, art, and world famous Penang food. 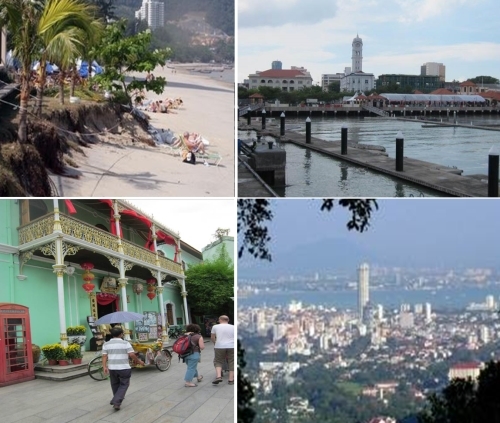 Many consider Penang the most livable place in Asia. It combines both busy city and quiet country, historical sites and ultra-modern services, with skyscrapers overlooking vistas of mountains, forests, sand and sea. While the home and heart of Paul Penders International remains on the Andaman sea island of Langkawi, obtaining supplies, shipping, and crucial services like internet and telephone can all be problematic on that tiny island three hours at sea. With both bridges and short ferry rides to the mainland, close to 2 million population, and bustling trade and industry, Penang island, by contrast, offers some of the best services in the world – and those are available even in the most peaceful, rural corners of the island. Just a short ride out of the city takes you past green mountains, lush tropical foliage interspersed with elegant residences, and sandy beaches with views out to the fishing boats and yachts lying just out at sea. In less than an hour, we pass through the famous seaside resort area, and then after a short drive along a narrow, twisting road, we arrive at the ageless village of Teluk Bahang where Paul Penders now has its headquarters. 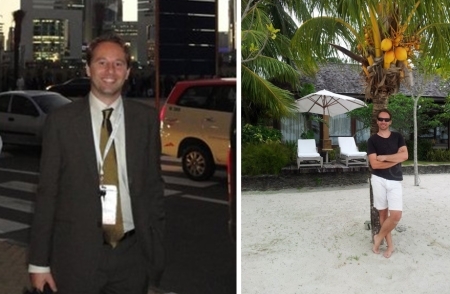 Nowadays Bastiaan no longer wears a suit and tie to work every day. He often appears at the office in a comfortable t-shirt and shorts. Father and son agreed; Paul Penders International would have its headquarters in Penang. This is in addition to manufacturing facilities in Kuala Lumpur and the Langkawi offices. With today’s communications, it’s almost possible to operate a business anywhere in the world! What’s a “Must Have” according one of Asia’s leading women’s magazines? We’re delighted to report it’s Paul Penders Calming & Soothing Mist! This ‘professional Salon Quality’ formula is one of our newest products! So says “Sisters Magazine.” It’s one of the most popular in Asia and the leading Chinese magazine in Malaysia. They know beauty and fashion! We’re delighted that more and more Asian women are discovering Paul Penders herbal beauty products! Paul Penders Soothing Mist is made without harmful chemicals that can damage your skin. The 22 certified organic herbal ingredients in our famous LevensESSENTIE Gold® formula soothe and calm your skin – and your spirit! 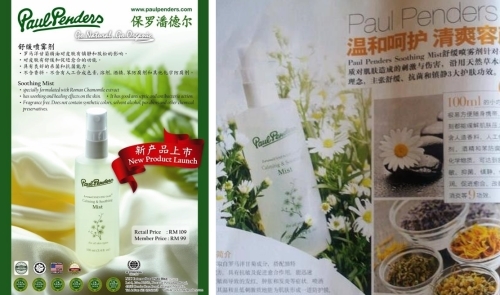 Asian women are discovering Paul Penders natural herbal cosmetics and other beauty products! We’re very excited about it! Life brings many surprises – some wonderful, others tragic. Life is so precious and so vulnerable. Hold on to the ones you love – and tell them how much you care! I remember the 2004 Tsunami when it hit Langkawi Island in Malaysia. On a beautiful sunny morning, I drove by the yacht harbor and suddenly saw total devastation. I had no idea what had happened just one hour earlier. Some boats were crushed; some were partly under water and some lay on the bottom of the water with only the upper part of a long mast visible. It looked like a warzone! It really struck my mind – what could have happened? Because the water was so calm! There was nothing I could do, so I went home (just minutes away) and turned on the TV in the hope of learning what had happened. Nothing on CNN! I switched to a local station with the same result, not a word about what I later found out was called a “tsunami.” I felt strange, like being in another world. A few hours later, new waves indeed came in and more boats were destroyed. On another island very nearby, the lives of 60 people were lost. Even here, on our small and well-protected island of Langkawi, a woman in a wheelchair was pulled into the water by the waves and died. I saw many houses flattened and people in distress. Again, no word or reaction from the local government or press – or even something on CNN. 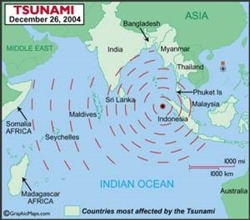 Countries most affected by the 2004 tsunami. Only later, CNN started to report about it. That evening, I saw my American president on television, and Mr. Bush not even able to pronounce the word ‘tsunami,’ telling the world he would make $300,000 available – thus I knew also he still had no real clue about what was going on, because this amount was not even enough to take care of even a small percentage of the calamity here on Langkawi alone. It wasn’t until late evening that the local Malaysian government started to talk about the tsunami publicly. The news started to spread that hundreds of thousands of lives had been lost in several countries. This was a day I will never forget! I am proud that Paul Penders Co. was probably the first to open its pockets to donate a sizeable amount of cash to the imam of the main mosque on our island. The donation was made this way to ensure the money would go directly to the most affected people, making it possible to cover their most immediate needs. The money was given to the leaders of the mosque, so that they never knew our company was involved – and for five years, it has been this way. I am so lucky to be able to live and work with great people on one of the most beautiful islands in the world. It is times like this when I realize how grateful I am to have them in my life. Let us always keep in mind that all things are vulnerable, that one single minute can change everything, and paradise can become like hell. Let us be happy with the potential we all have in us to act, to protect, to respect and to love.